WHO: Denzil Porter will be opening for rapper 360 with performance also by Bryant Dope. 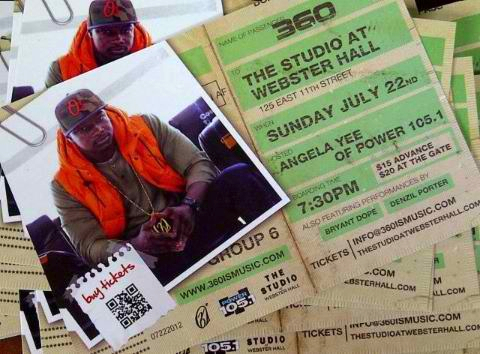 Angela Yee of New York radio station Power 105.1 will be hosting. WHEN: Sunday July 22, 2012. Doors open at 7:30 PM. Show starts at 8:00 PM. CONTACT: For more information please visit www.TheStudioAtWebsterHall.com. For media inquiries please contact Jeunesse Yvonne via phone or email at 917-596-6174 or JeunesseYvonne@gmail.com. For all other inquiries, please contact Denzil Porter’s manager, Mandell Conway at 347-835-1871 or MannyForbes@gmail.com. For more information on Denzil Porter please visit www.DenzilPorter.com.